Enjoy coastal living only 1 mile from Salisbury beach. Very desirable 55+ town home community: The Cottages at Windgate. Sought after "END UNIT" with lots of windows. 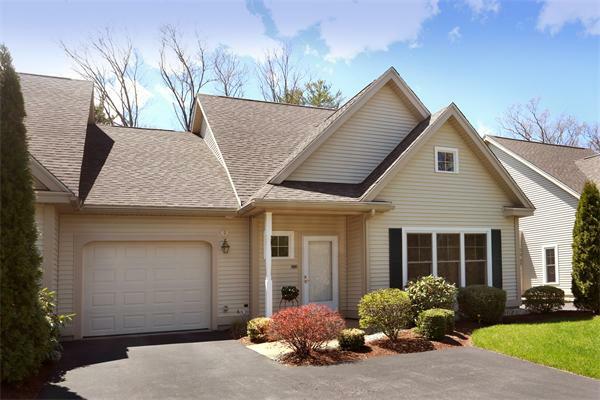 Open, airy, drenched w/ sun light & backs to a serene wooded setting. Soaring cathedral ceiling living room w/ gas burning fireplace, gleaming wood laminate floors. Spacious open floor plan for entertaining w/ dining & kitchen that opens to a bright 4 season sun room. Kitchen features breakfast island, tiled floors, oak cabinets & white appliances. Private 1st floor vaulted ceiling Master Bedroom Suite w/ walk in closet, 3/4 bath w/ tiled floor, double vanity & shower. 1st flr laundry. 2nd floor bedroom loft/living room & full bath for those stay over guests. Common area in separate building includes Reception/Conversation rm, Library, Billiard Rm, Fitness Center, Movie Theater, Kitchen & Patio for private functions. Limit of 2 pets per unit, dogs under 35lbs. Highest and best offers due Tuesday 10/2 at 4 PM.